Yeah... Something like that lol. Get a load of the Gertie Girl! 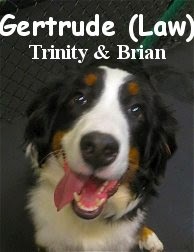 Gertrude, is an eight month old, sixty-seven pound, lively Bernese Mountain Dog. She had her assessment early this morning in the Big Roll. Once inside, she got in the game almost instantly. She speaks pretty good "DOG" for a pup, and mingled with almost every Big Roller we had today, in a happy and wild way. Gertrude sprinted, romped and played hard, just as we suspected. All the "Berners" we've come across over the years, have been happy-go-lucky and high-energy. We look forward to having Gertrude here at The Fort... We plan on assessing her "sister", Alice, soon. Awesome job today Gertie! Checkout the following clips of the good-looking-Gertie-gal, in play, with Theo, Max, Eleanor and a few others.